It looks out onto a square in the southwestern outskirts of Sassari, once open countryside. You will get to San Pietro di Silki via an avenue that runs alongside the walls of the former Franciscan monastery, attached to the church. The complex was built in the village of Silki (which no longer exists) between 1065 and 1082, as is indicated in the Libellus judicum turritanorum. It is part of the abbeys built at the behest of the Pope in Rome, contrasting orthodoxy. No trace of the establishment now remains: evidence of the life and activities that took place in the monastery between the 11th and 13th centuries come from the condaghe (a type of administrative document) of San Pietro di Silki. The building was rebuilt in Romanesque style in the 13th century: still remaining of the thirteenth century building are the bell tower and some parts of the wall of the main hall. In 1467, the monastic complex was conceded to the Franciscans by the archbishop and the town Authorities. 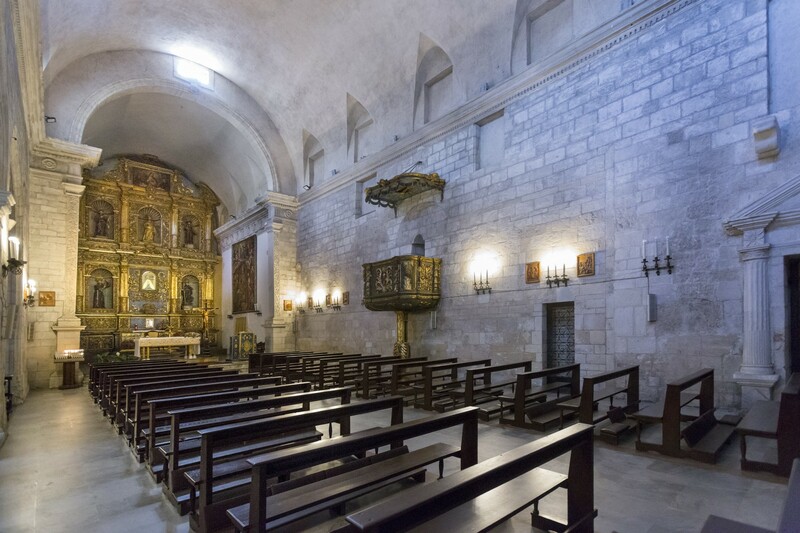 Between the 15th and 17th centuries, various renovations gave the church its current appearance. The Neoclassical façade dates back to 1675: it is horizontally in three parts and divided vertically by pilasters. In the resulting sections, three arches open up down below and there are three windows high up, two of which are gabled. By going through a rounded arch, on top of which there is the coat of arms of Antonio Mereu (who funded the renovation of the façade in 1677), you will come to the portico, with the choir on its upper floor. Inside, there is a single, spacious nave, with a barrel-vaulted ceiling (that replaced the original wooden trusses in 1672). On the left-hand side, there are four chapels. The monastery, which is now a charity home for the elderly, was once on the right-hand one. The chapel of the Madonna delle Grazie (Our Lady of Graces) (1475) is in Gothic-Catalan style: it has a pointed arch supported by pillars and a cross-vault with a hanging keystone. 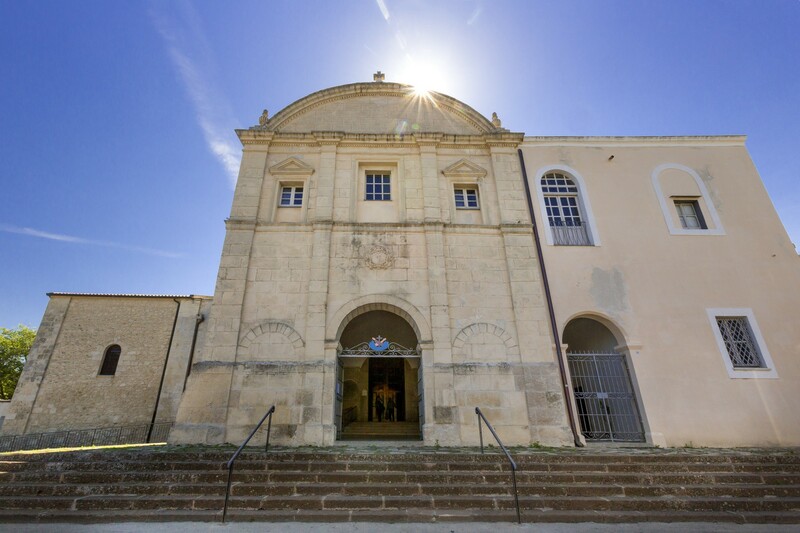 During the refurbishment that took place in the 17th century, two new spaces were added, one with a ribbed vault and the other with a barrel vault. In 1657, the chapel belonged to the gremio dei massai (ancient corporation of farmers) and a nineteenth-century candlestick is kept inside it, which is carried in a procession on 14 August, along with the symbols of the other corporations, in the Descent of the Candlesticks. In the middle of the sixteenth century, another two chapels were built - one with a barrel vault and the other with a cross vault. A fourth chapel opens up in the presbytery: inside it, there is a seventeenth-century wooden altar with an ancient statue of the Virgin Mary. 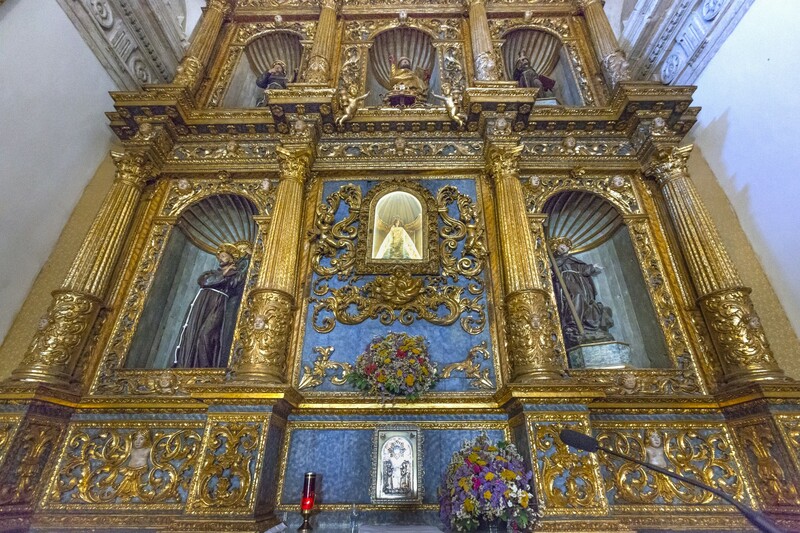 The magnificent golden wood main altar (18th century) is located in the presbytery, in which the many-coloured ceramic simulacrum of the Madonna delle Grazie col Bambino (Our Lady of Graces with Child) can be found and is the most important object of worship in the sanctuary. The church is a treasure chest filled with art from different periods. You can admire a nineteenth-century pipe organ, two seventeenth-century paintings, one of which attributed to Baccio Gorini, a 16th-century wooden crucifix, a statue of Saint Peter, an eighteenth-century gilded wooden altar dedicated to Saint Salvador of Horta and the statue of the Madonna del Fico (Virgin Mary of the Fig Tree), a fourteenth-century Catalan work.